We took our chances traveling West in December for a holiday break, and the weather gods weren't on our side, but Arizona's marvels have a magical lure even under gray skies & snow. When not fogged in, the dramatic views of Grand Canyon under a dusting of snow & heavy clouds are intensified. Always magnificent, the canyon sparkled when the sun appeared. There's a reason why almost 6,000,000 people visit the Grand Canyon each year - for it's beauty & vastness are unrivaled. From the Grand Canyon we headed south to Red Rock Country & Sedona's vortices. Nestled amongst the red rocks, this town of 11,000 is a spiritual mecca and artistic enclave, a haven for hikers, New Age followers seeking enlightenment, and aging hippies. Often called one of the most romantic towns in the USA. Gray skies and drizzle didn't deter us. Our last stop was Paradise Valley and Scottsdale described by the NY Times as "a desert version of Miami's South Beach". Again, gray skies and rain, but it's a pleasure to stroll this upscale town, and the vanilla brown sugar massages we had at our resort were a treat. Yes, Arizona is a 'red state', so it's best to leave the politics behind. Someone on the Internet wrote asking, "is there anything to do in Arizona beside look at rocks?". There is, of course, but it's the 'rocks' that are the main attraction, and what tremendous rocks they are. 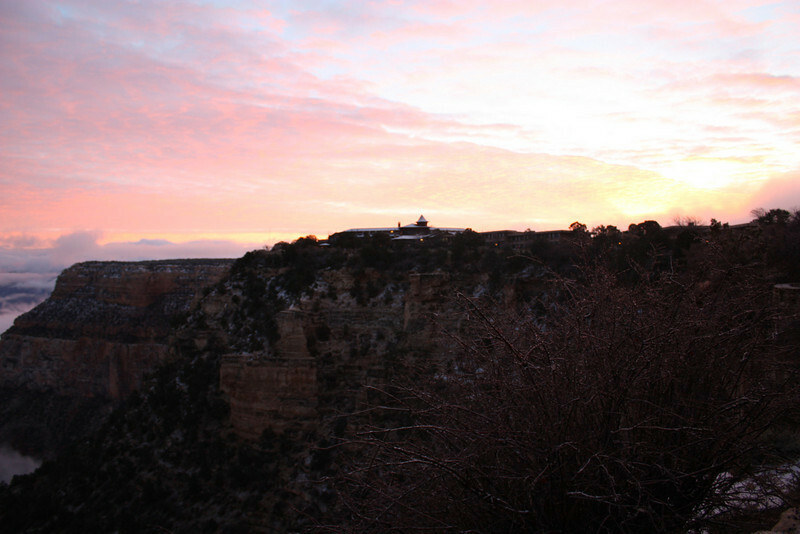 Sun rising over El Tovar at Grand Canyon.